the sweetest gift OF ALL - swissalpinehoneys Webseite! Since ancient times, honey is highly valued as an exclusive, delicious and precious gift. By presenting Swiss Alpine Honey to your family, friends, associates or customers, you express great taste, mindfulness and appreciation. Every single jar of honey from the Swiss Alps is a pure and limited masterpiece of the bees and a handcrafted delight. Did you know that honey is more than twice as sweet as chocolate, contains vitamins as well as other precious components and is a powerful source of natural energy far beyond sugar? Swiss Alpine Honey doesn't melt during transport. Moreover, honey remains fresh and consumable during a very long time period. 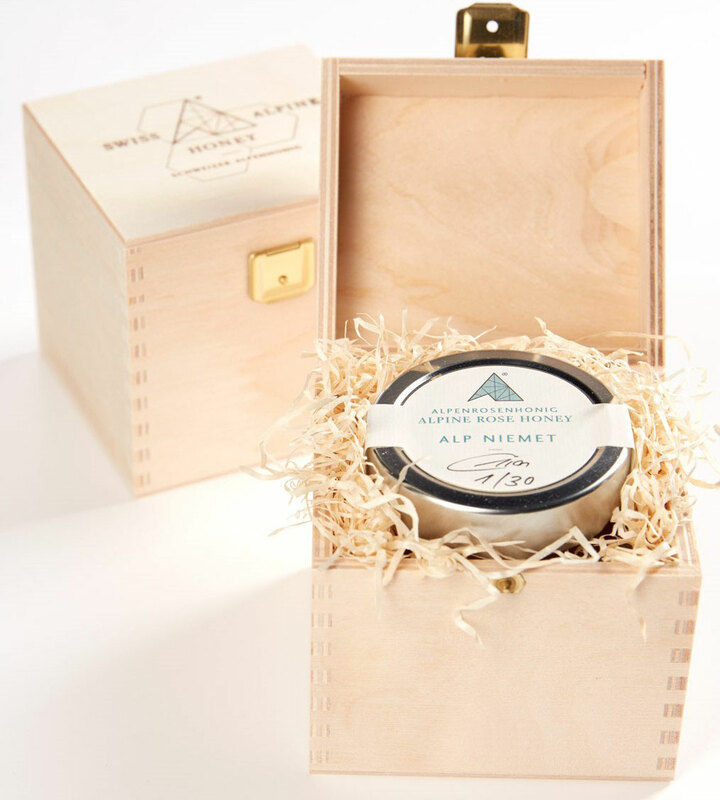 Our handcrafted wooden gift boxes are eco-friendly produced by a small and traditional family owned company in the Austrian Alps. The wood for these boxes comes from certified sustainable European sources with short transport distances - no tropical material, no cheap and doubtful sourcing and production. Our nice handsome box for the smaller 4,4 oz jars is a perfect gift enhancer and easy to carry. It adds even more value to the speciality honey selected by you and we'll further enhance it free of cost with wood wool if you wish so. 6 CHF per wooden box. This impressive box fits well for both medium (8,8 oz) and large size (17,6 oz) jars. If you ask for it we can add a nice portion of wood wool to it free of charge to make it an even more impressive gift. 7 CHF per wooden box. One size fits all jars - 4,4, 8,8 and 17,6 oz! This flexible box allows you to combine all kinds and sizes of Swiss Alpine Honey. Just add it your basket and we'll add wood wool to make it a great unique gift set for you free of additional charges! 9 CHF per wooden box.